The first smartphone brand to offer a genuine large-screen smartphone was Samsung with its Note series. But currently, there are too many companies coming in with identical phones. Probably, the most attractive of them is the Xiaomi Mi Max 3 and the Honor 8X Max. Today, we are going to find out which of them is better, takes better photos, has a longer battery life, sports a larger screen, etc. Although both phones use a large screen as the main design element, the design style is completely different. The Honor 8X Max sports a 7.12-inch LCD pearl screen, while the Xiaomi Mi Max 3 comes with a 6.9-inch screen that still retains the top and bottom borders. So although the two are similar in size, the actual display area of Honor model is higher than that of Xiaomi. Not only that, even the borders on both sides are even better on the Honor 8X Max. By the way, Honor’s screen has a Rhine TUV certification, while the Mi Max 3 doesn’t have. From the point of view of perception, the color temperature of the screen of Honor 8X Max is colder, while the Xiaomi Mi Max 3 is warmer. So the performance of Honor in terms of color and saturation is better. On the back of the fuselage, the Honor 8X Max uses plastic material, but it has a warm texture similar to glass. The double-texture design also makes the 8X Max look more refined. The Xiaomi Mi Max 3 comes with a standard metal + injection molded body that was popular in previous years. Therefore, it yields its competitor in terms of appearance. In terms of body size, the two are almost the same. However, the Xiaomi Mi Max 3 is wider. So it is weaker in the grip. Although the Honor 8X Max is a little thicker, the grip is better. It is worth noting that the Honor 8X Max continues the previous design style of the back camera, and this time it has almost no bumps. The Xiaomi Mi Max 4 uses the ‘iPhone- like’ style. That’s why it has pulled down a lot of appearance scores. The Honor 8X Max’s earpiece is much larger than that of the Xiaomi Mi Max 3. The measured results also demonstrate the fact that the Honor 8X Max stereo surround feel is stronger. When playing games or watching videos, the Honor’s model provides a better audio performance. We don’t like to compare the appearance of the smartphone much because it’s a matter of taste. Moreover, there are more interesting aspects. Say, it’s quite interesting to know how these phones behave when it comes to capturing photos. The Honor 8x Max’s camera uses a combination of 16MP (f/2.0 aperture) + 2MP (f/2.4 aperture) sensors to support phase focusing. The front camera has an 8Mp resolution, an aperture of F/2.0, and supports PDAF high-speed focusing. The Xiaomi Mi Max 3’s camera uses a combination of 12MP + 5MP lenses, with an aperture of f/1.9, and supports Dual PD dual-core focusing. The main photosensor of the Xiaomi Mi Max 3 is Samsung S5K2L7, which can be found on the Xiaomi Redmi Note 5. Let’s take a look at the real shot samples of the two phones. We can see that these handsets take almost identical photos when there is a sufficient light. But they have different adjustments in the tendency of color development. However, when capturing photos in low light conditions, the Honor 8X Max will perform better in terms of brightness. In contrast, the Xiaomi Mi Max 3’s purity is better. These brands offer the most popular system UIs of Xiaomi’s MIUI and Honor’s EMUI in the Chinese market. Both provide a smooth experience. As for the details, the Xiaomi Mi Max 3 runs on MIUI 9 based on Android 8.1 and can be upgraded to MIUI 10 through OTG. 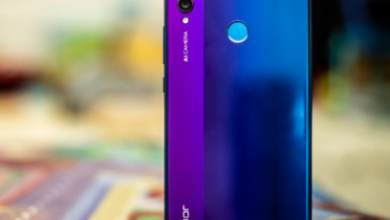 The EMUI 8.2 of the Honor 8X Max is also based on Android 8.1. But what we must mention is that the current MIUI system, especially in the low-end and mid-end product lines, still has a lot of advertisements. From the app store to the weather calendar, you can see the shadow of the advertisement and it cannot be closed. At this point, the EMUI carried by Honor performs much better. Both are equipped with the Qualcomm Snapdragon 636 mobile platform and 4+64GB storage combination. So they are very similar in terms of processor performance. The results of running scores also confirmed there is no difference in performance between the two. As for the charging and battery life, the Honor 8X Max is equipped with a 5000mAh battery, while the Xiaomi Mi Max 3 comes with a 5500mAh battery, which is the top level in terms of battery life. Through our five-hour endurance test, the latter still has 65% of the remaining power, while the Honor 8X Max still has 63% of the remaining power. Thus, Xiaomi consumes about 1925mAh and the Honor consumes only 1850mAh. In the same way, it can be calculated that the Xiaomi Mi Max 3 charges 1540mAh for half an hour and the Honor 8X Max is filled with 1550mAh. Thus, the Honor 8X Max is better in terms of charging speed and endurance. Although the two phones are similar in price and configuration, this comparison showcases there are obvious differences. After reading the above comparison, we believe that everyone has a new understanding of the cost performance of these two phones. The Xiaomi Mi Max 3 has a larger battery capacity and uses the more advanced USB Type-C interface. And the Honor 8X Max uses a more eye-catching design, excellent screen, and speaker. The system has less advertising and more features. Plus, the 8X Max has a little advantage in taking photos.